Are you facing slow Internet speed problem on your Android phone? If yes then today we have to discuss an important trick which helps you to Get Reliance Jio Internet or WiFi Speed Notification Bar on Android phone. This guide helps you to get notifications bar at the top which shows Internet or WiFi speed on your Android phone. At present Reliance Jio too much popular due to his Reliance Jio Welcome and latest Reliance Jio Happy New Year offer. All we know Reliance Jio 4G preview offer is valid only for three months and last validation date is 31st December, 2016. But before days ago Reliance Jio Chairman Mr. Mukesh Ambani announces the Reliance Jio Happy New Year Offer extend up to March 2017. You can get free access of 4G Internet, using VoLTE voice calling, video calling feature, send free sms download and watch videos, movies, games and many more. You can easily increase Reliance Jio speed at your Android phone. Internet speed refer the speed which kind of data travelling from WWW to any Android phone, Computer or Laptop. Internet speed is measured in-terms of Mbps (Megabits Per Second). Most the person want to know how much Internet speed they will get. In this guide you will get a solution about Reliance Jio Internet or WiFi Speed Notification Bar on Android phone. 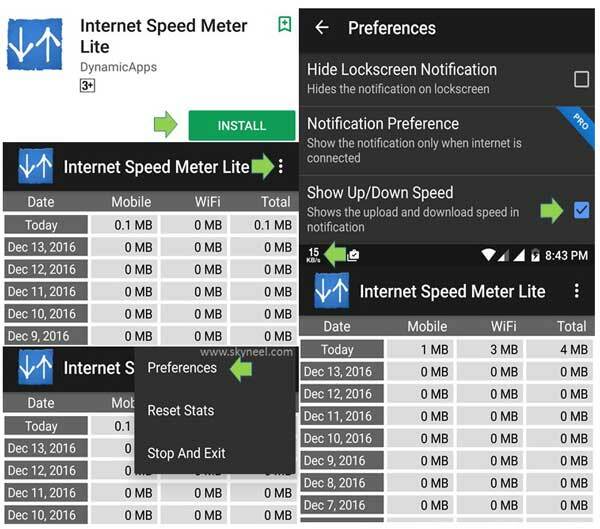 Step 1: Download and install Internet Speed Meter Lite app from Google Play Store on your Android phone. After finish the installation process open Internet Speed Meter Lite app on your phone. Step 2: Tap on the three vertical dots which is shown on the top right corner. Tap on the “Preferences” option and turn on “Show Up/Down Speed” feature. After turn on this feature you will get a horizontal notification bar at the top on your Android phone. I hope after reading this article your problem will be solved. Now you can easily get Reliance Jio Internet or WiFi Speed Notification Bar on Android phone. When you start downloading then you can check Internet speed will be changed during the downloading process at notification bar. If you have any suggestion regarding this guide then please write us in the comment box thanks to all.